Kellogg Community College’s women’s volleyball team was back in winning form Tuesday with a win in five sets over Grace Bible College’s junior varsity team in Grand Rapids. The Bruins took set one 25-17, set three 25-25 and set five 15-7; the Grace Tigers took set two 25-21 and set four 25-22. 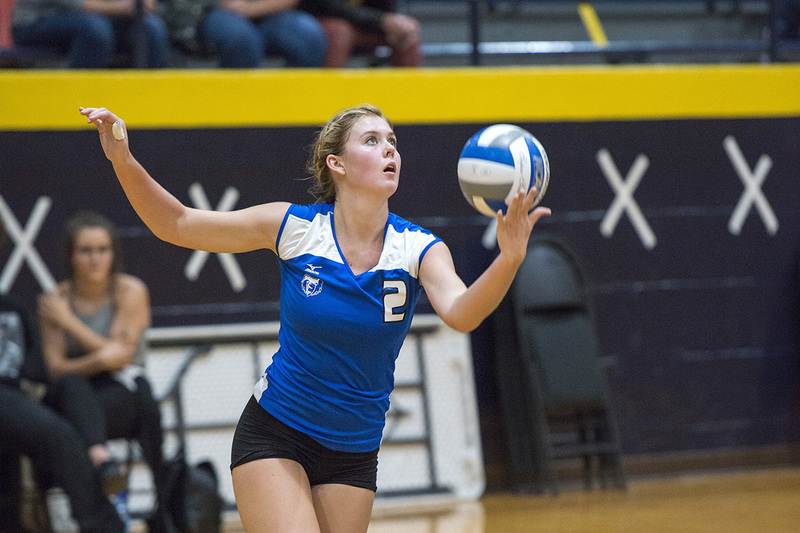 KCC was led on the court by sophomore Hannah Landis (Three Rivers/Three Rivers High School, pictured above), who had 17 kills, 3 blocks and 10 digs; sophomore Kim Kusler (Battle Creek/Harper Creek High School), who had 12 kills, 4 block assists and 10 digs; and freshman Kameron Haley (Battle Creek/St. Philip Catholic Central High School), who had 29 digs, 3 aces and 3 kills. Tuesday’s win brings the Bruins’ overall record for the season so far to 9-3; the team’s conference record is 4-3. KCC’s next match starts at 6:30 p.m. Thursday, Sept. 21, at home at the Battle Creek Central Fieldhouse, 162 Champion St., Battle Creek, against conference opponent Ancilla College.